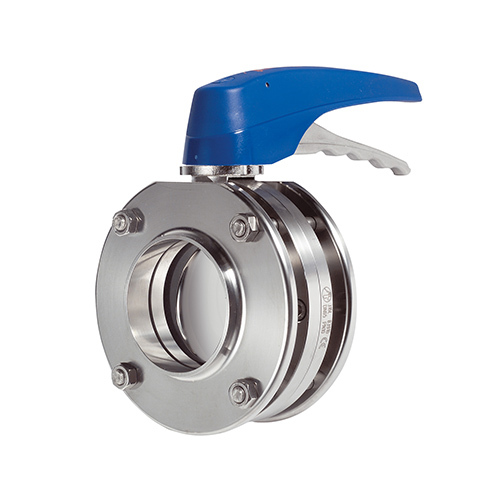 Sandwich butterfly valves, whether manually or automatically operated, can be used in most liquid product applications in the food-processing, pharmaceutical and chemical industries. 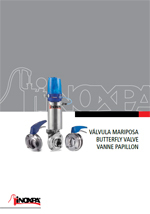 The design allows to easily instal or remove the valve without separating the pipes. 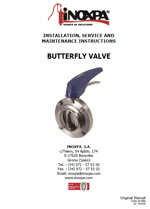 The butterfly valve can be operated automatically through an actuator or manuallywith a handle. The handle blocks the valve in the "open" or "closed" position, although there are alsoother models with intermediate positions.The actuator transforms the axial movement of the piston into a 90º rotary movementwhich it transmits to the disc. Bodyhalves interchangeable with any connection type. Two sizes for two-position handle. Electric actuator or single- or double-acting actuator, the size is determined by the operating torque of the valve. 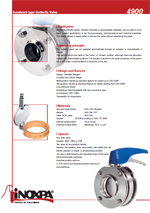 C-TOP control unit (inductive position sensors or microswitches).